stacking strength up to 150 lbs. Easy and comfortable finger grips on the handles. ZZ-RSO-1408-7 is available in black only and with an attached lid. Allow three days to ship. Heavy-duty, straight wall containers maximize your space when used for shipping, storage or work-in progress. 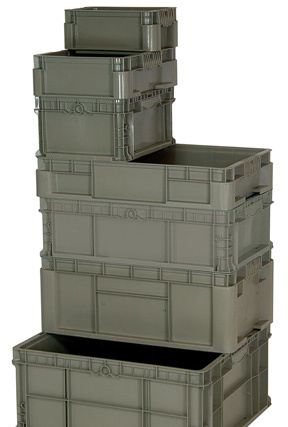 Greater strength and durability provided by reinforced corners allowing this strong container to hold the heaviest parts. Containers are injection molded from high density polyethylene. Straight wall design allows for the modular stacking of all sizes on standard pallets. Hand grips on two sides make the container easy to handle and carry. 12 x 7-1/2 x 5"
12 x 15 x 5"
12 x 15 x 7-1/2"
24 x 15 x 5"
24 x 15 x 7-1/2"
24 x 15 x 9-1/2"
24 x 22-1/2 x 11"
Lids are designed to fit onto Heavy-Duty Straight wall containers. Containers are intended to maximize and improve the efficient use of space when used for shipping, storage or other purposes. Injection molded from high density polyethylene. 12 x 15 x 1"
24 x 15 x 1"